Summary: There are some secrets you're better off not knowing. But once Ever Bloom is given a glimpse of what Damen is keeping from her, she had to find out more- whatever the cost. Review: I started reading 'The Immortals' series pretty late so, when I first picked up Evermore, Bluemoon and Shadowland were also availble. This was a plus, as I was hooked after the first chapter and in each book I was left eager to know what happened next. Having read the first three within a month, I was left desperate for the next instalment. The story of Ever and Damen's forbidden romance is mind-blowing. You are left wanting more and the sexual tension between the couple is prominent in each novel. That's no different in the latest of the saga, 'Night Star'. What I enjoyed about Night Star was the unlikely bromances between Damen and Jude and Damen and Miles. 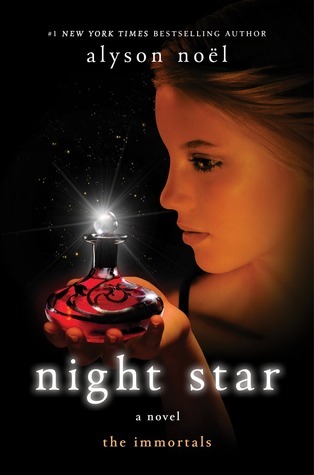 Alyson Noel definitely got the characters spot on in Night Star. Haven's power mad attitude is highlighted now she's immortal. I love the subtle twists in this book, especially in the ongoing love triangle between Ever, Damen and Jude. As much as I am always hoping Damen and Ever's love will conquer all, I am also so sad for Jude. He always loses in the end and he's so gracious about it. Just when you think there may well be a happy ending as their enemies are no more, another twist comes into play. I am eagerly awaiting the fifth and final instalment of 'The Immortals'. I really liked this book! And the cover is so pretty!